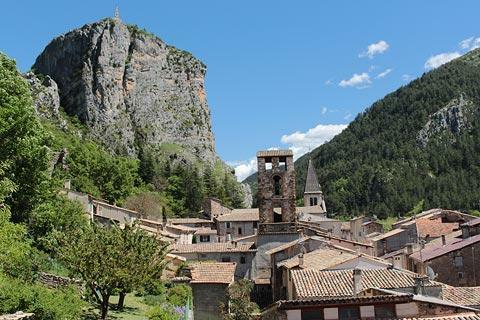 Castellane is found at the north-east end of the Gorges du Verdon in the Alpes-de-Haute-Provence department, and is a popular base for exploring the gorges and other scenic highlights of the region. 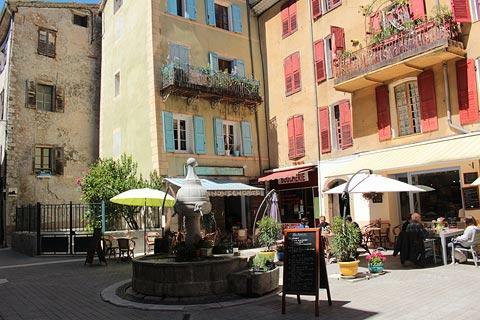 France This Way comment: although the historic centre of Castellane is quite small, it is pleasant to explore and with the lovely setting and the associated visit to the Chapel Notre-Dame du Roc a visit is recommended. 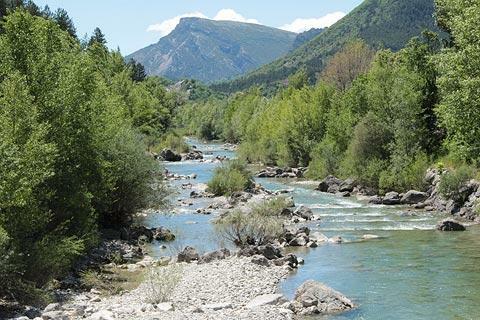 When you arrive in Castellane there are various car parks available: we prefer the car park south of the river Verdon next to the swimming pool because there is a nice part of the Verdon river here that you might otherwise not see, as well as a view to the Rock. 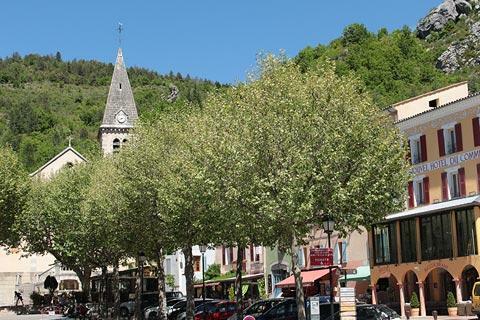 The town centre of Castellane is clustered around the Place de l'église and the streets to the west of the square. 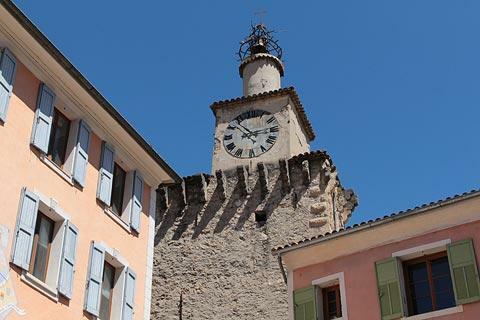 There are various sights of interest to see as you explore the old centre including an ancient tower now with a clock and campanile on top, very close to Castellane Tourist Office at the west end of the old town. The original tower was built in the 14th century as part of a gate through the ramparts, and the clock and campanile were added in the 18th century. If you follow Rue Saint-Victor from here you reach the 12th century Church of Saint Victor which combines elements of both gothic and roman styles of architecture. Among the more recent buildings of interest are the Town Hall, in a neo-classical style, and the 18th century Chateau d'Eoulx. Just on the eastern edge of Castellane there is a 15th century stone bridge called the Pont du Roc, built to replace an earlier bridge that stood here by the 9th century. It was in March 1815 that Napoleon crossed this bridge when returning from exile in Elba: hence the bridge and Castellane also form part of the popular Route Napoleon tourist route. 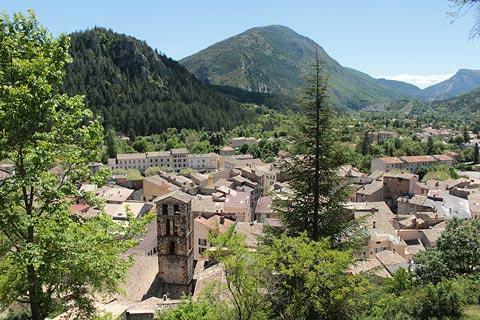 The old town is also surrounded in part by the original 14th century ramparts: you can see these to the north of the town centre in Castellane. The ramparts include an unusual five sided tower. Around the base of the tower there are terrased gardens (although these were very neglected when we visited). 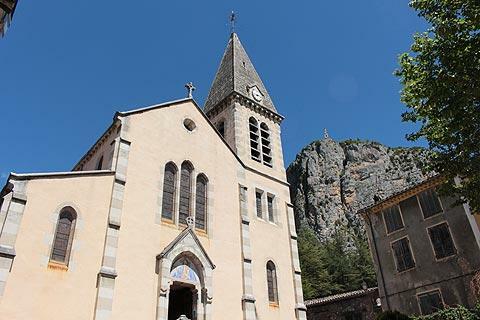 Everywhere you go in Castellane you are aware of the large cliff-sided rock next to the village that supports the Chapel of Notre-Dame-du-Roc. The current chapel dates from the 18th century, although an earlier chapel on the same site was built in the 12th century. Be sure to walk up to the chapel and the top of the rock, above all because the chapel terrace has very impressive views over the village and surrounding countryside. Allow about one and a half hours to reach the top and return and bring water if it is hot, it is only one kilometre but rather uphill! There are 14 stations of the cross and two oratories along the path. 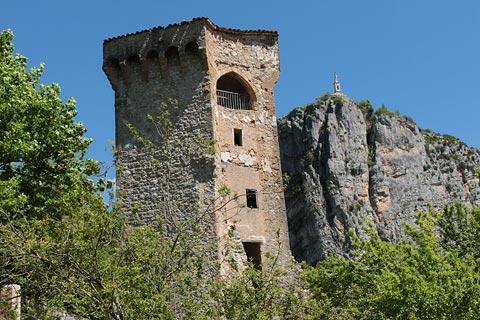 You will also see the ruins of Petra Castellana, the small village that was here in the 11th century, before the current town of Castellane was developed. The path is a continuation of the same path you followed to see the ramparts. You can reach the Chapel of Notre-Dame du Roc if you follow the path up the hill behind the Church of Saint Victor or the Church of the Sacré Coeur (the church on Place de l'église, to the east of the historic centre) or from the Church Saint-Joseph to the west of the centre. Weekly markets in Castellane are held on Wednesday and Saturday mornings (the Saturday market is the larger of the two). Not surprisingly given its location the town is a popular centre for all kinds of outdoor activities in the region. 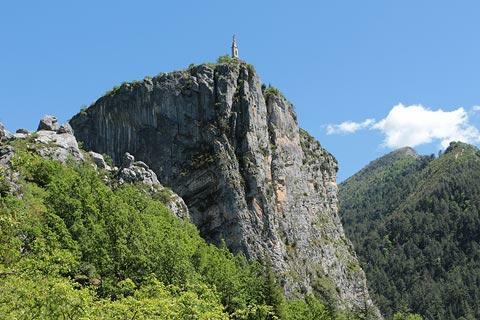 Apart from excursions to the Gorges du Verdon all manner of outdoor activities can be enjoyed in the surrounding countryside. 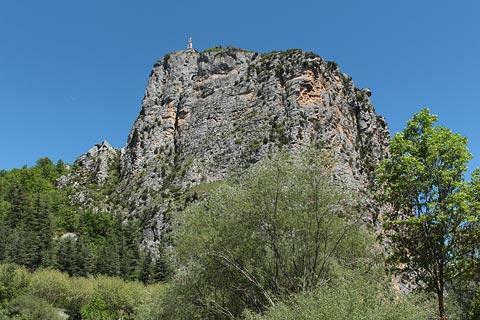 The most popular activities include hiking, cycling, mountain climbing and canoeing, and activities based around the leisure lakes in the region such as Castillon Lake. 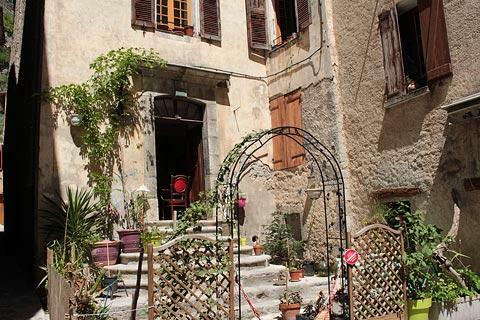 The tourist office in Castellane can guide you if you would like to follow one of the waymarked hikes to explore the countryside. 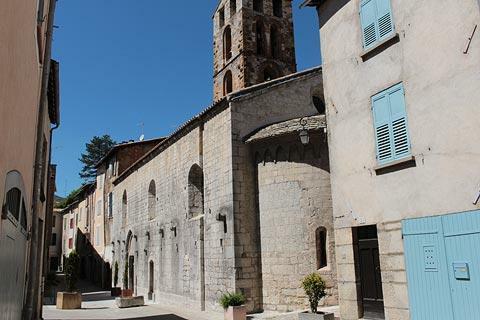 Other villages that you can visit near Castellane include the small villages of La Garde and Blieux, and Bargeme and Trigance to the south.